As if we (and Craven) didn’t learn this lesson with Deadly Blessing, here comes another example of how outside involvement in one’s creative process is bad, mmmkay? Funny that it would be with the second movie Craven directed with the word “Deadly” in the title (although the title was originally the same as the book on which the story is tenuously based). I speak, of course, of 1986’s Deadly Friend. Based on Diana Henstell’s novel Friend, Bruce Joel Rubin wrote the screenplay for this story about teenaged computer genius Paul and his robot BB, and how they moved to a new town, where Paul fell in love with pretty blonde Buffy the Vampire Slayer Sam, who ends up dead at the hands of her abusive father around the same time that Paul loses BB to a blast of rifle shot from the neighborhood hermit who was just trying to be hermit-y. So what does Paul do? Implants BB’s A.I. chip into Sam’s brain, of course. Hilarity…didn’t ensue. Just a whole lot of WTFery. Oh, also, Rubin’s most famous other contributions to Hollywood are that he wrote Jacob’s Ladder and Ghost. That kind of lessens the sting of this train wreck. Although, again, this is all about the damage of outside demands. So what happened with this movie? A whole lot of wrong. See, Warner Bros. was delighted to have snagged the director who had been riling up the horror crowd for more than a decade at this point and had just dropped Freddy Krueger on audiences to continuing success for New Line Cinema. They wanted to channel that power into their own pockets, which translated to they wanted Craven to deliver something as horrific or worse than A Nightmare on Elm Street into their movie collection (see the movie’s poster above, which claims that this movie was Craven’s “most horrifying creation,” which was kind of right, but for all the wrong reasons). Craven, however, had a completely different idea. He was tiring already of being known only as a horror director. With this film, he was hoping to do something more like a sci-fi thriller/love story. Something sweet and intriguing, not disgusting and unsettling like most of his other movies. Neither Warner Bros. nor his devoted fans were feeling this. When he finished the first cut of this movie, which went through title changes from Friend to Artificial Intelligence to A.I. and finally to Deadly Friend, everyone but Craven was disappointed. Fans wanted gore. Warner Bros. wanted gore. Also, WB VP Mark Canton wanted an ending that makes absolutely zero sense but that ended up being the new ending because no one tells the emperor that he looks stupid naked. Craven ended up going back in and adding a bunch of gore and a few minuscule scares throughout the film to satisfy the fan demand, and re-shot the ending to match the upper echelon request…and what we ended up with was what I would now categorize as the kind of movie that is enjoyable when you’re young, but that contains far too many plot holes and questionable decisions to continue to be enjoyable to an adult with a hyper-critical mind. It actually surprised me in all the bad ways how much I couldn’t enjoy this movie anymore. 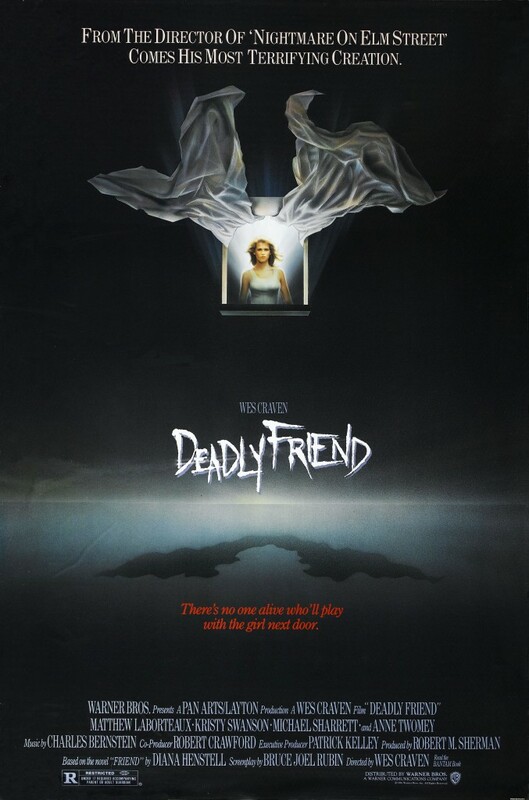 Not really scary, not really sci-fi, extremely dated, and with tons of questionable choices, I at least can say that Deadly Friend is still fun to watch for two reasons: catching all the anachronisms and poor choices; and one of the greatest horror death scenes ever. Think basketball versus head. 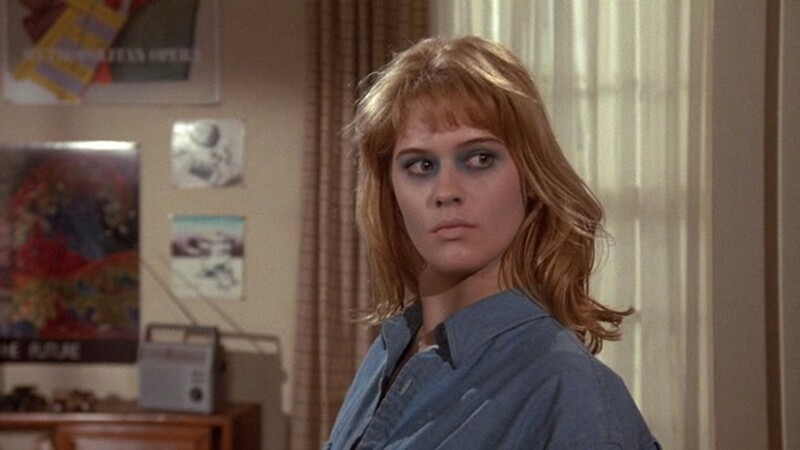 Seriously, I could come up with a better corpse makeup than this. Then again, was she a corpse? Was the A.I. processor taking over the functions of a living entity? Or was it merely animating dead flesh. That was never really addressed, but something needed to be touched upon to explain this ridiculous makeup. She just walked around like that for most of the time that the character was “BB/Sam,” until it was no longer convenient but literally made no sense that she started to function normally toward the end only to…well, we’re getting ahead of ourselves. Back up to the fact that, in addition to moving like BB, Sam also sounded like BB. Which meant that Sam sounded like a demented Roger Rabbit, because Charles Fleischer made the annoying noises attributed to the robot. Why? She only possessed BB’s A.I. processor. Not his vocal chords. Of course, they never really specified how BB made any noise in the first place. Still, there should have been no way that his voice could have come from her larynx. That was just silly, and made all the sillier when she then started to sound like herself at the end. Even sillier than this? The ending. Ugh, the ending. So Sam meets her second ending from a bullet from a deputy’s gun after causing a whole bunch of death and destruction. Paul, still unwilling to let go of probably the only girl to ever show any interest in him (and for some reason not in a cell of his own for stealing a dead body and re-animating it for this death trek through this once-quiet town), breaks into the morgue to steal Sam again, only to find that somehow a robot has grown beneath Sam’s human skin, breaking through at just the right moment to start choking Paul before the film mercifully finally fades to black. Oh, but not before we hear that Sam once more sounds like BB. This seriously was one of the worst endings possible for this movie. I don’t care if Canton was one of Warner Bros.’ VPs at the time. This ending makes NO SENSE. How would a robot grow? And what happened to Sam’s bones and organs and blood? Paul stole her body from the hospital before she could be embalmed or prepped in any way for burial. Everything was still there. Only now it transformed into robot parts. Never mind the fact that, right before Sam is killed again, she’s starting to show signs of returning to a more normally functioning human, with normal human movement and normal human speech (or that, when she’s shot, she bleeds and we don’t hear any tin ricochet noise or something equally ridiculous). What was that all about? How could she be going full human only to then turn into a robot at the end? Logic, you are completely MIA from this film. Still, with all the terrible, I’d still rather watch this than Chiller ever again. I’m not sure that’s saying much, but it’s all I’ve got at this point.